Markets Of Sunshine: Decadent Nature at Your Service! Snowflake: Rise and shine and step out into the sunshine! Got a little dittie for you by that great oldies singer Mr. Burl Ives to get you in the mood for some shopping fun! The names were changed to protect the ...Hit it boys! To a sympathetic beetle by his side. I'm such an decadent bug." They were so happy they came! At the decadent bug ball. He said, "Would you care to dance?" Their dancing led to romance. At the decadent bug ball! Sunshine: That is the cutest song, I am singing it already and dancing around with my apron cape on!!! Our featured shop this week is Jennifer from Decadent Nature! You'll find her shop in our Sunshine Market Place and can see her decadent natural products and learn a little bit about Jennifer. You'll find lotions, and lip balms to sooth those delicate skin issues. Why not stop by for a visit today! You can make this a great week for Jennifer's spotlight feature by shopping in her store and helping get the word out about her great natural products. Snowflake: I hear you have some special news to share with our readers. Sunshine: I sure do Snowflake! I was a guest on Shabby Lane Shops blog talk radio show last week! Wahoo!! I shared some yummy gluten free recipes and am doing a give-a-way contest on my Jeanpatch blog. Why not check it out today! Find our website in the Apple ITunes Store! Sunshine Farm Girl Co-op is also featured on Apples App store under Shabby Lane Shops. Now, we have another great way for folks to find us and shop with our vendors and Etsy team members. Woot! Just another great reason for folks to support the co-op by joining and help keep the co-op thriving with these great ways we advertise here at Sunshine Farm Girl Co-op. Shabby Lane Shops & there we are! Coming Soon! to Kindle Fire & Android tablet! 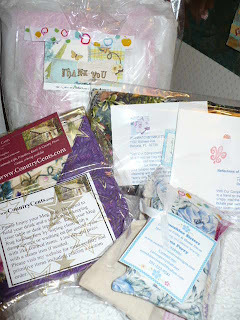 We are thrilled that we have had such a wonderful response to our Eco-Gift Sampler Bags. We will be sending one out to a national magazine editor. One will go to a local newspaper editor. If you would like to order one of our Eco-Gift Sampler Bags, please click here! Get to know us better, join as a 'Buyer Club' member/Vendor and get your first month as a vendor free! Your membership includes numerous levels of advertising all for the one low annual price of $20.00!Click here to preview the benefits of Sunshine Farm Girl Co-op membership! Sign up for our co-op Newsletter! to get great savings when shopping with our vendors and diy projects and news! Snowflake: Thank you for all those great updates Sunshine! And thank you dear reader's for spending time with us today! Check out the Calender of Events for our craft show location. Tune in next week to find out who is in the spotlight! Same co-op time!!! Same co-op blog!!! Check out the natural skin care products by Decadent Nature. The honey scrub is so good for your skin. That's not all we have so come see who else is featured!